Joyride150 Indoor Bike Park is a 102,000sq/ft indoor biking facility for bike riders of all disciplines & skill levels. Joyride150 features beginner/sport/expert sections, a foam pit & resi jump, rhythms & jump lines, a BMX street park, pump/race tracks, a cross-country loop with climbs and much more. It also houses a retail concession counter with snack, drinks, helmets, gloves and padding. (We sell BMX bikes, parts, accessories and clothing in our store, The Boiler Room). Joyride150 provides rental services for bikes, helmets & padding, as well as private Party Room rentals for special events like birthdays or conferences. Programs, skills workshops, day camps, private instruction, races/competitions, demo days, and PK sessions are all offered at the park. There is something for everyone – beginner riders to pros will find challenges, fun, and fitness. WHAT KIND OF EQUIPMENT IS REQUIRED TO RIDE AT THE PARK? In order to ride at the park you need a bike and a helmet…but if you don’t have either of these, we do have rentals! Check out our RENTALS PAGE for more details. No. Joyride 150 is open to cycles only. WHAT KINDS OF BIKES ARE ALLOWED? Bicycles, bicycles with training wheels, runbikes, unicycles, tricycles. WHAT LEVEL OF RIDING SKILL IS REQUIRED? 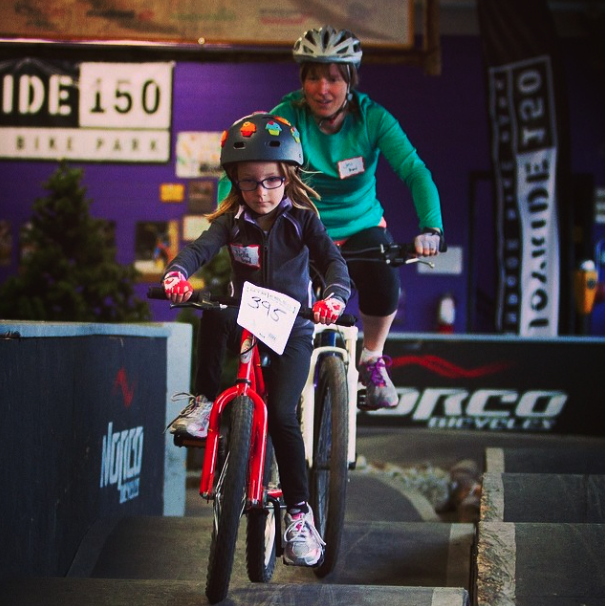 There is something for riders of all levels at Joyride 150…from beginners to experts. Sections, trails, lines & jumps will all be marked according to the ski trail system: GREEN CIRCLE for beginner, BLUE SQUARE for intermediate, and BLACK DIAMOND for expert. We expect that you will use good judgement and ride within your skill level. You will need to fill out our waiver before entering the park for the first time (SPECTATORS AND RIDERS). Fill out the online waiver at home to decrease your time in line and increase your time on the bike! PLEASE FILL IT OUT COMPLETELY…it will save time and people waiting in line won’t get annoyed with you! If you are under age 18, you will need your parent to sign your waiver – NO EXCEPTIONS! (***Other adults cannot sign your waiver – it must be your parent). Either bring a parent with you to sign or have them fill out the online waiver at home. The first time you come you will be asked to pay a registration fee (1st-time only) of $5.00. This is for the waiver, photo, file processing, and your club card. Pay for your riding…either buy a Day pass, a 2-Day Weekend pass (Sat + Sun), a 3-Day Weekend pass (Fri + Sat + Sun), a 6-Month Membership, or an Annual Membership. Children under 6 must be accompanied by an adult that is with them at all times. Make sure their skill level matches the terrain. It’s not a jungle gym – your child should be on a bike, not running around the pump track. Be alert! Tell your kids to look out for fast moving riders – and not to just charge into an area. Collisions happen. We have a wide range of bikes available for rental (BMX, DJ, XC, Youth BMX, Run Bikes). Helmets and padding also available for rent. Check our Pricing Page for rental costs. Comfort Inn – Toronto Northeast is located in the heart of Markham, close to highways 7, 404, 407, 401, and it’s only 10 min driving time from Joyride150. All fully renovated guest rooms feature refrigerators, microwaves, hair dryers, irons, coffee makers and 32-inch LCD flat-screen televisions. Our guests enjoy Indoor salt water heated pool, Fitness room, Whirlpool and Sauna.